As I started reading up about Sensory Processing Disorder one of the first things that kept coming up was visual timetable. Now I had already been researching this as a way to transition between activities without meltdown! However it was one of those small ideas that come up every so often around here that get out of hand and take months to complete! Below is how it looked when first finished. It’s a bit of a work in progress though and we add magnets as we realised we need them. I asked for magnetic black board paint for Christmas with the idea of re-doing the understairs cupboard door. I had seen the paint used on various blogs for makeovers. I’m not sure if I could recommend it or not. It definately does do what is says on the tin, and we do now have a magnetic blackboard. 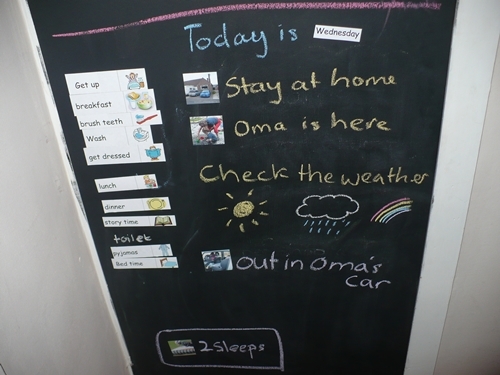 I bought some coloured chalk from ikea for the writing and then wondered how to actually make a visual timetable. I knew I wanted to use the printable magnets that I had also gotten for Christmas. I expectced to download something to print but nothing seemed quite right. 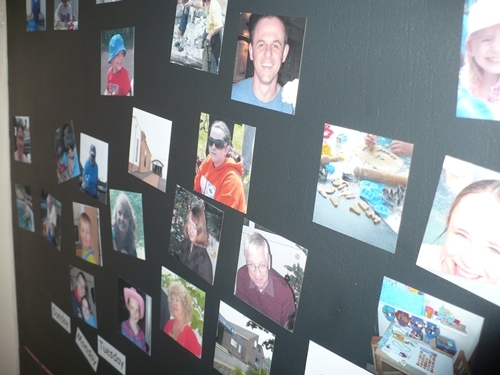 In the end we settled for printing 2″x2″ photos of friends, places and activities (such as church, park, shopping, baking etc). 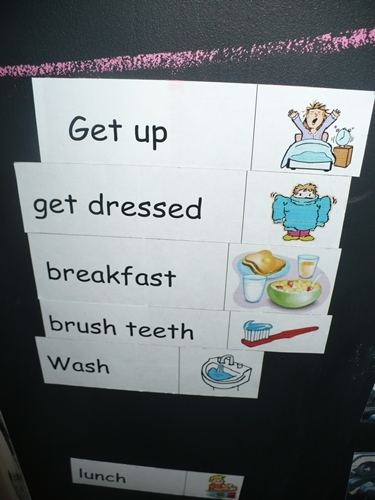 As well as more standard daily routine blocks with words and downloaded clip art that I put together myself. I also made blocks for days of the week. We keep all the magnets at the top and I put together the day’s timetable on the bottom half of the door. We also put things that are coming up with the number of sleeps to go countdown on here! Edited to add: See later post here for a download of the visual timetable graphics. and here for when we changed to a week at a time. Great to see parents using this idea at home! 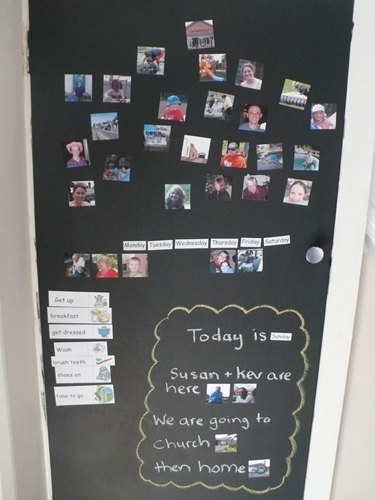 I use a similar idea with my ASD children at school using a strip of velcro with picture symbols on it to show the timetable of their day. Keeps them calm because they know what to expect. This looks fun for “average” children too. Thinking of doing this for Ruth (10 months) to start to learn words and symbols…. our kitchen changes in October so this could be a good moment to change over our current (blackboard only) wall…. thanks Ruth!